Two-part adhesives, otherwise known as epoxy adhesives, are often stronger than instant adhesives, and are used to bond more difficult materials. They harden when mixed with a second component, or “activator,” which causes a chemical reaction. They tend to reach full strength only after curing. While they require more time to set than instant adhesives, two-part adhesives are generally easier to clean up, and for that reason, are preferred by some in the screen printing industry. The FOTECHEM 2300 Series of adhesives is designed to quickly and reliably adhere mesh to frames made of aluminum, steel or wood. It is especially designed for high modulus mesh and can be used in automatic washout and reclaiming devices. Each product in the series is distinguished by color and viscosity and categorized as either activator or glue. If the listed product ends in ‘5’ then it is an activator to the adhesive which ends in ‘0’. FOTECHEM 2320 adhesive is a fast-drying mesh to frame adhesive. It cures quickly to full temperature and solvent resistance. It is compatible with the FOTECHEM 2325 catalyst at a mixing ratio of 1:5. FOTECHEM 2330 adhesive is a fast-drying mesh to frame adhesive. It cures in 4 hours to full temperature and solvent resistance. It has a long mixed pot life of up to 24 hours. FOTECHEM 2330 is compatible with the FOTECHEM 2335 catalyst at a 1:5 ratio. Questions? Comments? Interested in purchasing? Click here to contact us about this product. 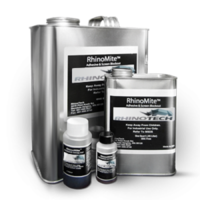 RMA 3000 is a two part adhesive that offers high tensile strength, impact and solvent resistance. It dries in approximately 8-15 minutes. Once mixed, the pot life is three to five days depending on storage (ideally, store in a sealed container to extend usage). RMA 3500R is a red frame adhesive offering high tensile strength and impact and solvent resistance. Dries in approximately 10-15 minutes. Once mixed, RMA 3500R has a pot life of 5 or more days if properly stored in a sealed container. As of June 30th, 2017, Dynamesh Inc. has been renamed NBC Meshtec Americas Inc. The change in name better highlights our tight integration with our parent company, NBC Meshtec of Japan. However, our product lines, pricing, and commitment to quality remain the same. All contents © 2019 NBC Meshtec Americas Inc.. All rights reserved.